Years ago, in another life before having kids, my husband and I lived in Queensland and made friends with a couple called Sacha and Leigh-anne after we joined the Bible study group they hosted. Sacha and Leigh-anne were down to earth, funny, outdoorsy types who loved to go camping and listen to Garth Brooks in the car (Steve could only just tolerate the Garth Brooks bit, but I loved it). Each week we’d all bring our takeaway dinner to their house, share the highs and lows of the week, study the Bible and pray together. Their home was always open, they never bunged anything on for any of us (Sacha was often in the bath when we arrived) and they didn’t mind one little bit if you made yourself a cup of tea. In that season of life, we all grew lots spiritually and had lots of fun times together. These days we all live a long way from each other, but some friends from the town we now live in, Gavin & Chantell, have moved to their town – and to our delight have found good friends in each other. Last week, while on holidays we got to have the second annual Three Family Get-together, and just like old times shared with both families, it was delightful: a relaxed catch-up, fun and games as Sacha kept us entertained with his stories, all the while sharing simple but yummy food. Chantell brought this tasty dessert that went down a treat with everyone and I had to give it a go myself and share it with you. Hardly ‘cooking’ at all: it’s more like assembling a salad from a bunch of ingredients, this versatile dessert costs about $17 to make, but it does serve 15 people. For a smaller group, simply halve the quantities, which also halves the cost. As all the ingredients (except the cream) can be stored in the pantry for when you want them, I recommend buying them up when on special to make this even more affordable. Thanks for the recipe, Chantell. Choose a medium sized casserole/pie/oven dish, and spread a thin layer of caramel on the bottom. Place a layer of evenly spaced biscuits over the top of the caramel, followed by a layer of cream. 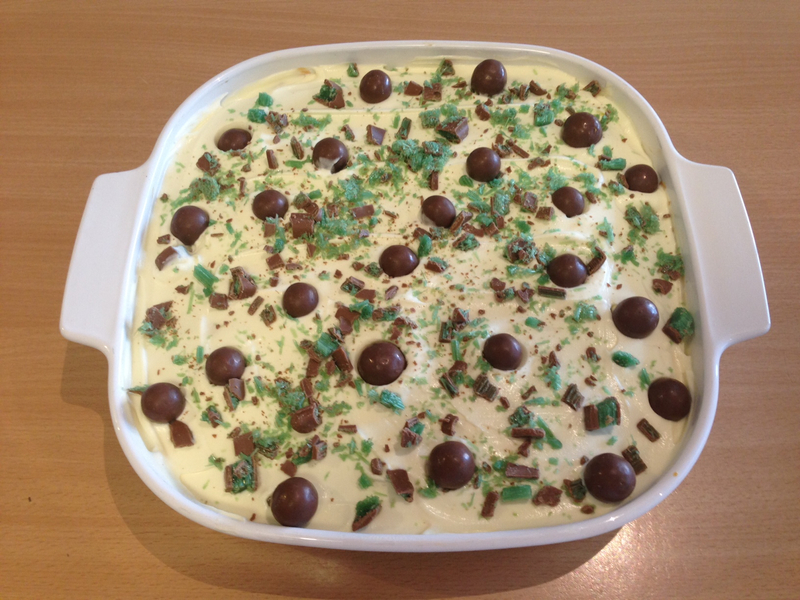 Sprinkle 1/4 of the peppermint crisp over the layer cream. Repeat this series of layers until all the ingredients are finished or the dish is full. 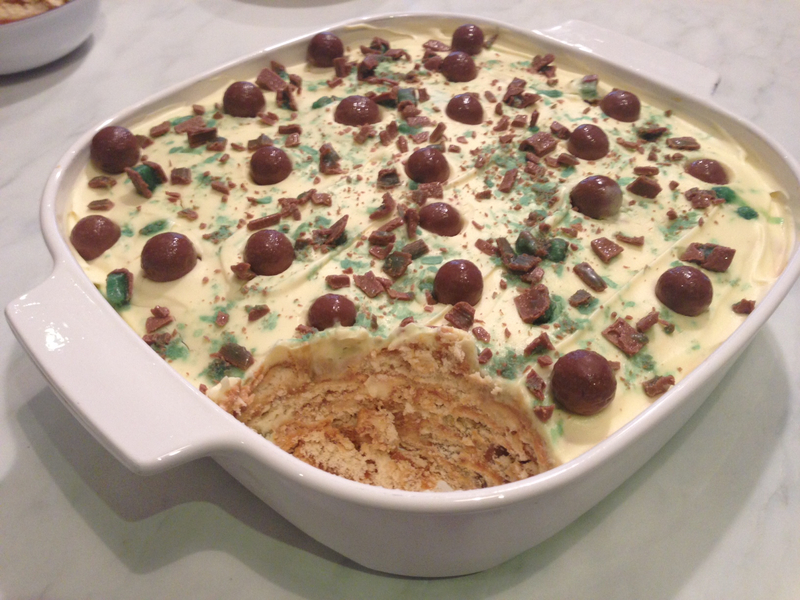 End the layers with cream and the remaining peppermint crisp. I had some leftover malteasers in the pantry so popped them on top too – feel free to improvise. Place in the fridge for 24 hours to allow for softening and setting. Enjoy with ice-cream or without.